The 74ALVC00 is a high-performance, low-power, low-voltage, Si-gate CMOS device and superior to most advanced CMOS compatible TTL families. The 74ALVC00 provides the 2-input NAND function. 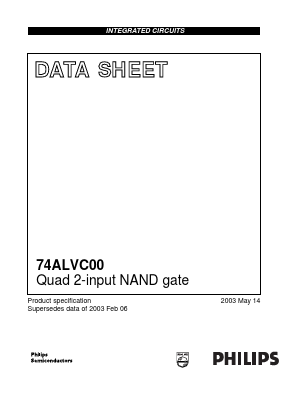 IN74HC00A Quad 2-input NAND gate high-performance silicon-gate CMOS View Integral Corp.
IN74ACT00 Quad 2-Input NAND Gate High-Speed Silicon-Gate CMOS View Integral Corp.